2 What is a Stair Stepper? If you have a set of stairs at home, you can already get your cardio workout done without having to use an exercise equipment at home. If you don’t, the best stair stepper machine is easily available to help you get the job done as it’s perfect for improving strength and endurance while doing so in the comfort of your own home. A stair stepper is an exercise machine with two pedals that alternate in height. Designed to replicate the movement that you have to do when climbing the stairs, this equipment requires you to push down each pedal to get a good workout. It primarily makes use of a piston or motor to push the pedals back up while your body weight will serve as your primary challenge as you have to carry your entire body on upward movements. Also referred to as stair climbers, stair steppers shouldn’t be confused with step mills. The latter has a few stair steps that move downward and collapses underneath which is a concept that’s a lot similar to a treadmill’s track. Owning one of these machines is basically like having your own set of stairs right in your home gym, letting you do different stair routines without having to cause a ruckus and disturbing your entire household or building. Stair steppers mainly work out your lower body muscles including the quadriceps, calves, hamstrings, and lower abs. As this machine will make you do vertical lunges, you’ll be able to really strengthen these muscle groups. If this workout seems too strenuous then you can always choose another option such as lifting weights. While there are claims that you can easily burn 400 calories with a stair stepper, this might just be a rough estimate as the results really depend on each person. As the stair stepper is a weight bearing machine, your weight can affect a number of calories you burn. Experts say that a 150-lb person can burn up to 477 calories in 60 minutes, though, so if you’re heavier than that, you can get even more out of this machine. A lot of people believed that stair steppers can damage your knees but sports medicine experts have refuted this claim. It’s actually a low-impact workout as your joints don’t really get any pressure from your movements. This guarantees virtually no injuries, less fatigue, and even more energy for you to perform more. Stair steppers can also do wonders for your balance and stability as you’re training your legs one at a time to carry your entire body’s weight with every “step”. This helps strengthen your core and if you won’t rely on the handrails to up the challenge, you can also improve your balance and stability. Considered by many as one of the best workouts ever, stair climbing is made more convenient by stair steppers. Even without an actual flight of stairs at home, you can still enjoy the great effects of this workout in your home gym. As described above, stair steppers make use of pedals that you step into. It’s a lot like an elliptical machine, except you’re supposed to push your foot downwards to create a climbing motion. These exercise machines are great for heavier folks as they can provide a lot of challenge without straining your joints. However, it’s important to go for a unit with a high weight capacity to ensure your safety. Mini steppers are smaller versions of stair steppers. They make use of the same principles as their big brother, just packed in a smaller package. They’re designed to fit tighter spaces, making them great picks for those who live in apartments or condominiums. Some of these units don’t even have handlebars so you can easily stash them away underneath your bed for quick storage. The Stair Master is actually a widely popular step mill brand. The concept behind this machine is a lot like the treadmills. It provides a moving surface that replicates a flight of stairs, though, instead of having a moving belt where you can walk and run in. This brand also offers a number of stair stepper machines, though, in case you just like the brand but want a pedal-type stair climbing equipment. Step mills can get really huge in size, though, so if you don’t have a lot of room at home, this might not be a wise pick for you. However, if you want a fully functional home gym, this machine is a solid investment. Choosing among these three types is very important as it can quickly narrow down your options and give you a good idea what kinds of workouts you can do. Stair steppers are definitely great if you want a low-impact cardio workout, but they don’t really offer a wide variety of routines as step mills do. Most exercise machines come with a display screen that will let you monitor your performance. Some stair steppers have them, others don’t. While these accessories don’t really alter the capacity of your machine, it can still be a great addition so you can know more about your work out. It’s entirely up to you, though, if you want one or not. Whether you choose to order an exercise equipment online or not, you’ll still have to assemble the unit in some degree. It’s best to find a stair stepper that’s easy to assemble so you can start exercising right away. Like other workout equipment, stair steppers also require motors to work. For stair steppers, you can choose between a manual one or an automatic. Manual units are often cheaper but they can’t offer the same intensity and performance as the automatic machines. Another important thing to consider is the space you have at home. Stair steppers can range from compact to massive, especially the step mills, so you need to know how much room you have before you purchase a unit. To help you find the best stepper machine that will fit your needs, here are a few product suggestions that might interest you. Living in a teeny apartment shouldn’t stop you from getting the benefits of stair climbing. If you don’t want to get a complaint from your neighbors for running up and down the stairs for a few minutes daily, the Sunny Health & Fitness 012S is a good choice for you. Its tiny footprint makes it a compact stair stepper machine that won’t take up too much space. 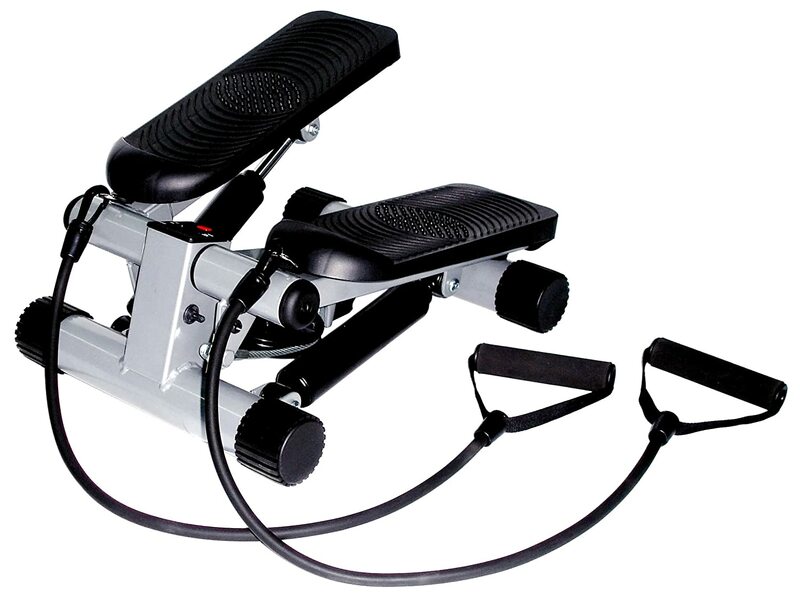 This unit is basically just a pair of oversized, slip-resistant pedals with hydraulic cylinders for resistance and exercise bands to provide an upper body workout for the user. The resistance is adjustable with a knob and the frame is made of solid steel, making it sturdy, rust-proof, and reliable. It can handle up to 220 lbs, so it can be suitable for a wide range of users. What a lot of people might not expect in this exercise equipment is its LCD monitor. For its really affordable price, you might not think that the manufacturers will add this extra feature, which is a nice touch, really. It displays the count of your steps, time, speed, calories burned, total count, and scan. With such a low profile, stashing this equipment away is one of the easiest things to do. You can quickly push them under the bed or a table and call it a day, making them ideal for those who are looking for a simple tool to get fit. One of the criticisms stair steppers tend to get is that their workouts can get quite monotonous over time. Stepping up and down can get boring and some folks don’t think that it’s challenging enough. If this is the very thing that’s holding you back from getting the best stepper, you have a slightly different alternative with the Sunny Health & Fitness Twister Stepper. Instead of just moving up and down, the pedals in this unit also move slightly to the sides, letting you twist a little as you move. This helps give a good workout for your thighs, obliques, and buttocks on top of your gluteus maximus, hamstrings, calves, and quadriceps that are the target muscles of steppers. With the additional exercise bands, you can also get an efficient workout session as it will exercise your upper body as well. Like the Sunny 012S, the Twister Stepper is also very compact, making it a great pick for apartment and condo dwellers. The low profile and light weight make it easy to store and transport, so you don’t need a home gym to enjoy this in your humble abode. Featuring a heavy-duty steel frame, this unit will be able to carry up to 250 lbs. It may not be that much, but it can already cater to a lot of users. Its foot plates are oversized to accommodate a wider range of users and outfitted with slip-resistant pads to ensure safety. Those with balance and stability issues may not find the first two steppers safe as they don’t have handlebars that can provide support. If this is your case, you can check out the Sunny Twister Stepper with Handle Bar. 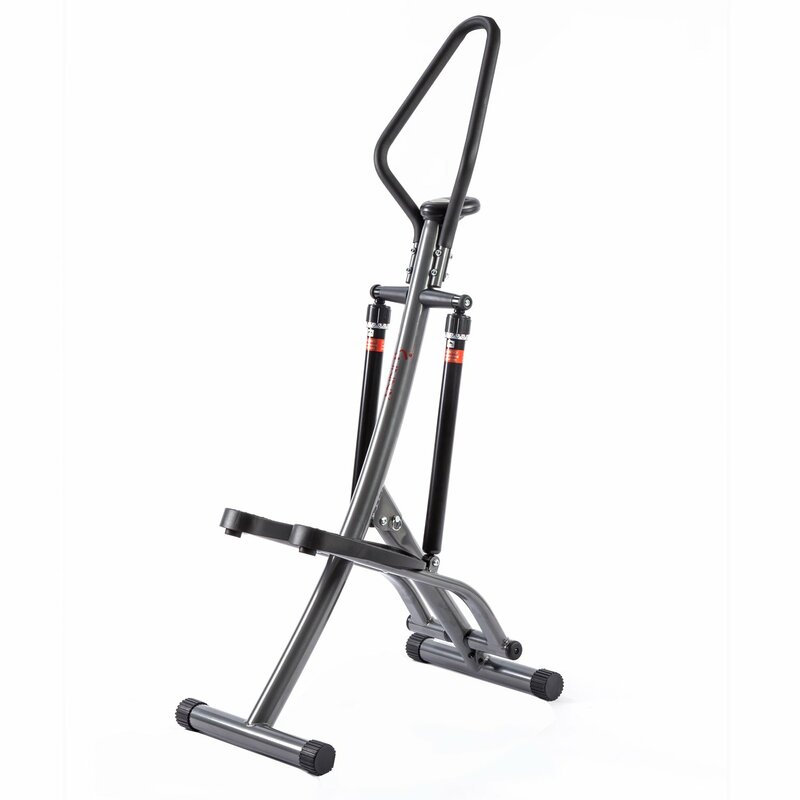 This product is a lot like the Twister Stepper, but the handlebar makes it a better investment for those who need something to hold on to while their lower bodies exert the effort to get a good workout. Featuring a solid steel frame that can handle up to 250 lbs, this unit offers more than just up and down movements. It moves laterally as well to target more muscle groups in your body, giving you more benefits for working out. This unit also comes with an LCD display that will help you keep track of your workout. It displays your time, calories burned, and step count. It can make monitoring your progress a lot simpler, letting you effectively up the challenge on the following sessions. Despite having a handlebar, though, this unit is still pretty compact. It has a small footprint, so you won’t have a hard time finding a spot for it. Storing it can be a challenge, though, because its components won’t fold. If you want to up the stakes of your home workouts, the best stepper for you will have to be more challenging than the ones listed above. Stair climbing might be too simple for you, so why not consider experiencing the intensity of mountain climbing during your workouts? With the Sunny Folding Climbing Stepper, you can enjoy this and torch more calories in the process. 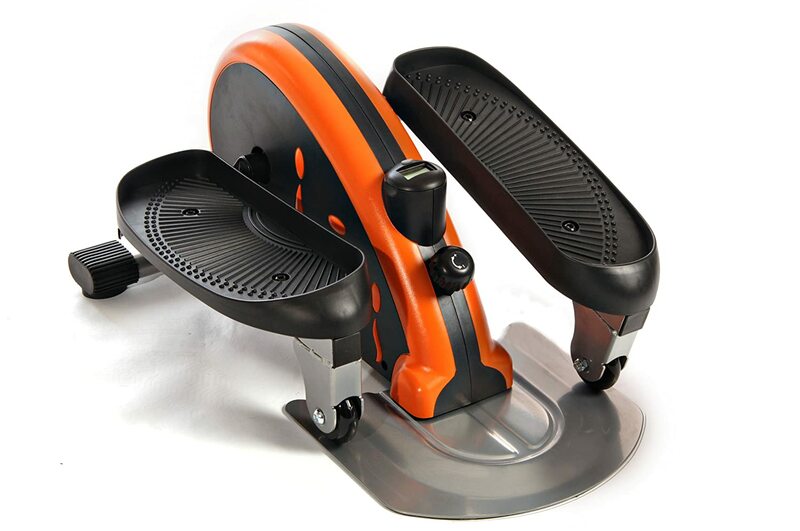 The first thing you’ll notice about the Sunny Folding Climbing Stepper is the height of its footplates. 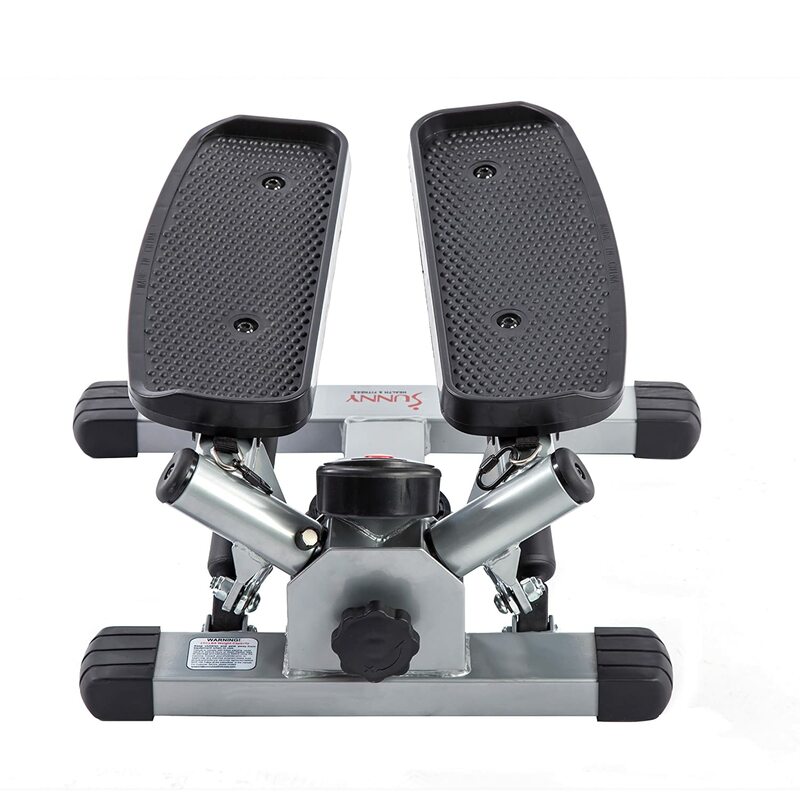 The pedals can reach as high up as your shins, so you will have to be ready for a heavy workout if you intend to get one. It’s designed to replicate the movements you make when climbing a steep incline or hilly terrain, so it’s bound to offer punishing workout sessions. Another thing to note about this product is that because it’s not bulky, it might feel like it won’t hold up under your weight nicely. If you’re worried that it will topple over when in use, fret not. This unit is very stable and makes use of heavy-duty steel to carry the user’s weight and exertions without a flinch. It can handle up to 220 lbs so you’re guaranteed that it won’t pose a risk when in use, even as you exert a lot of effort to burn calories. But what really makes the Sunny Folding Climbing Stepper a hit is its folding mechanism. This portability and compact design combined with a promise of a heavy workout really make it one of the best steppers in the market today. 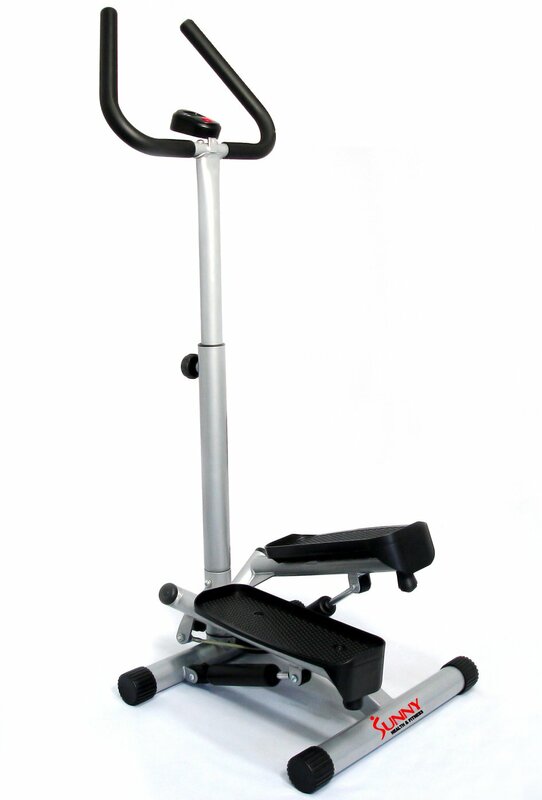 A lot of people purchase stair steppers without handlebars to help them keep moving even while working on the computer. As sitting down is one of the health risks of office workers, equipment like these will help them stay in motion without having to alter their work environment too much. The Stamina In-Motion Elliptical Trainer is one of the most popular products that you can get for this purpose. While this isn’t exactly a stair stepper, this equipment is configured to be usable in two ways. This makes the unit capable of replicating a stair climbing movement aside from just letting you take steps. Combined with the fact that it’s usable whether you’re standing up or sitting down, it’s certainly a good pick if you want a versatile exercise equipment. Its adjustable resistance makes it even more flexible. You can select a high setting for a challenging workout or keep it loose and easy so you won’t easily get tired while keeping your legs moving under your desk. Its low profile makes it an even more popular pick among folks who want to get fit by moving all the time. Not only does it let you use it while on your desk, but it’s also relatively compact that you can easily stash it away when not in use. The absence of handlebars will also help ensure that you’re expending as much energy as you possibly can as there’s nowhere to lean for support. This also helps develop your balance as you’ll have to stay sharp and on top of your movements so you won’t slip and fall out. There’s also a small electronic console attached to the unit that monitors your movement, so you can easily know how well you’re performing. This will let you track your steps, workout time, and calories burned. For those who want a solid stair stepper for their home, the Stamina SpaceMate is something worth looking into. Designed to be a full-sized stepper machine, it’s designed to provide the support and workout you need without taking too much space in your home. Ideal for folks who are willing to invest a little bit more money and use up more space at home just to replicate a gym workout, the Stamina SpaceMate is a full on the stair stepper. It’s complete with all the trappings you need to get a good session with a stair stepper, from the stats console to adjustable resistance so you can tweak your workout according to your needs. It’s basically a home version of stair steppers at the gym so you can enjoy the benefits of stair climbing exercises right in the comforts of your own home. Made with durable, heavy steel, you won’t have to worry about how well it will hold up against your weight. It has a generous 250-lb weight limit, so a lot of users will already find it useful for their needs. It’s also very stable and well-balanced, so you can be sure that it’s very safe to use. Another major selling point of this machine is its folding mechanism. With this, you won’t need a home gym to enjoy this unit as you can easily store it in a closet or under the bed after use. Ultimately, this stair stepper review guide will help you to understand the best products available in the market. We want our readers to have all the information needed to make the best decisions. We answer all lingering questions that are presented from future customers so that value is delivered to your door. We know this is a big financial and health investment that can potentially affect your future so read more about our adjustable dumbbells reviews if you want that quality performance.